For any developers in the Telerik community that develop WinForms applications using the Composite UI Application Block, this is some very exciting news. Today we announced and released the beta of our new RadControls for WinForms CAB Enabling Kit. This new kit provides seamless integration of the RadControls in CAB-based smart client applications and makes the process of using Telerik's WinForms controls with the CAB among the best in the industry. The new CAB Enabling Kit is going to be actively supported and updated by Telerik, earning status as a separate Telerik product. Obviously, it will be freely available to all WinForms subscription holders. 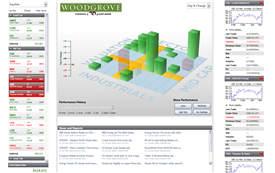 Before the official release in Q2, the Kit's WPF Woodgrove Finance-like demo will receive some need fit-and-finish, but other than that it is ready for you to start downloading and testing. We look forward to supporting CAB developers in the future and to enhancing the Kit to make it the best development experience available for developing rich CAB-based applications. Download the CAB Kit beta today and then give us your feedback in the forums. The most active beta testers have the opportunity to earn up to 5,000 Telerik points!